Retro Royale is going to be the newest special event in Clash Royale, and let me tell you, this one is awesome! 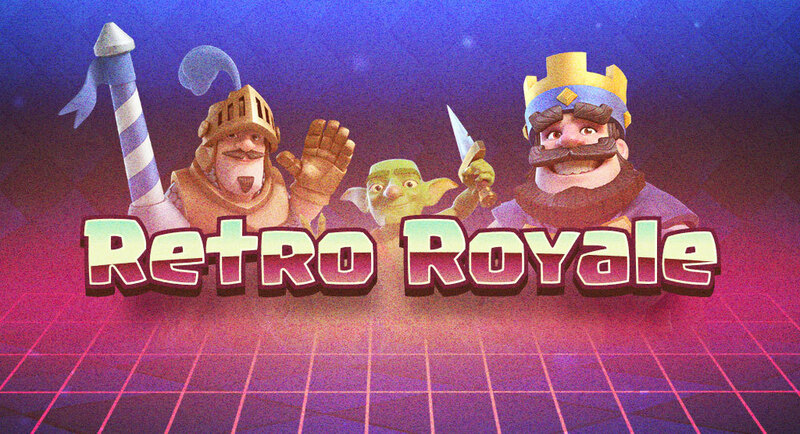 Retro Royale is taking Clash Royale back to the good old days, before the royal giant, before the furnace, and before elite barbarians! 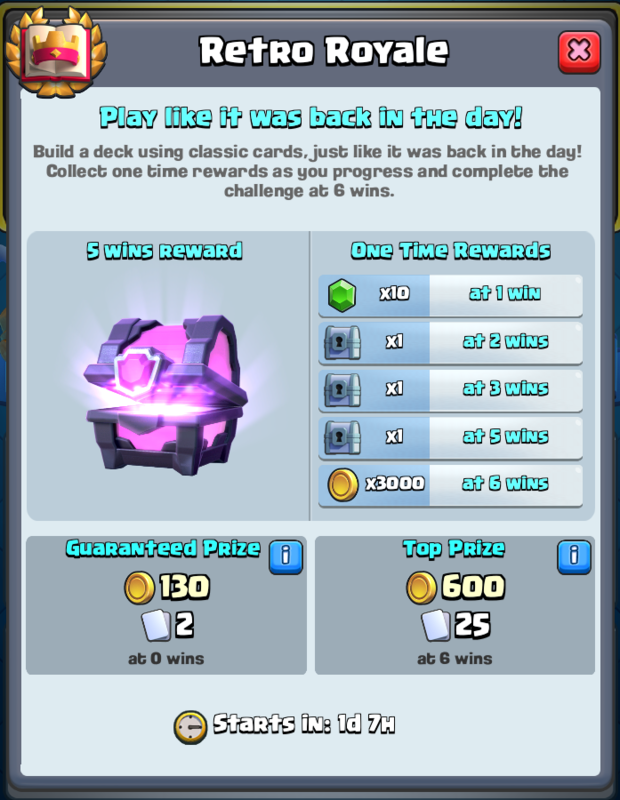 In this Retro Royale challenge, battles will be exactly like it was when Clash Royale first came out in January of 2016! 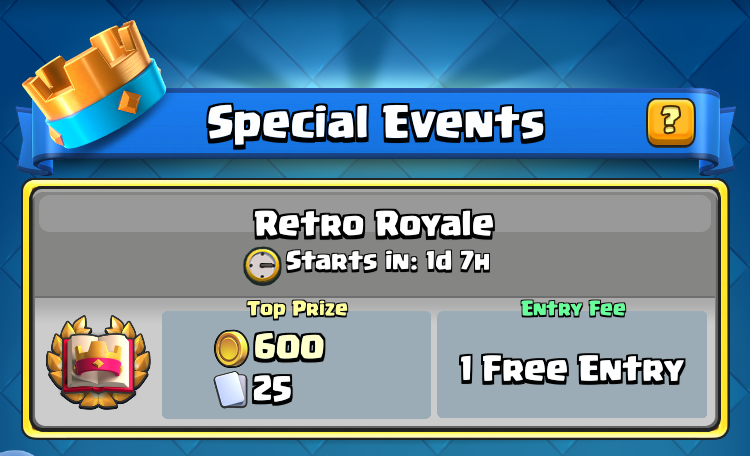 So as you guys have probably figured, Retro Royale is a throwback special event. ONLY the cards that were available when Clash Royale was first released will be available. This means that there will no cards added in any update, which is roughly 2/5 of all cards. The Clash Royale team states that Clash Royale was smaller back then, so the rewards and the challenge will be smaller. From the challenge intro screen, the top rewards are shown, which are much smaller than even a 10 gem classic challenge. 600 gold and 25 cards will be handed out for the (hopefully) many victors of this event. But there is a free entry, which means you should definitely do try your hand at this challenge! The biggest twist with Retro Royale? Top prizes will be handed out at 6 wins, instead of 12 wins. Rewards are quite small with this challenge, so the Clash Royale team added a bit more of an incentive. Here are the rewards for certain amount of wins along with your Retro Royale chest! So if you are lucky enough to hit 6 wins, you can collect a whole bunch of other rewards as well as a decent 25 card chest. However, you are going to need some awesome decks in order to be able to actually hit 6 wins…. Here are some of the best Retro Royale decks! 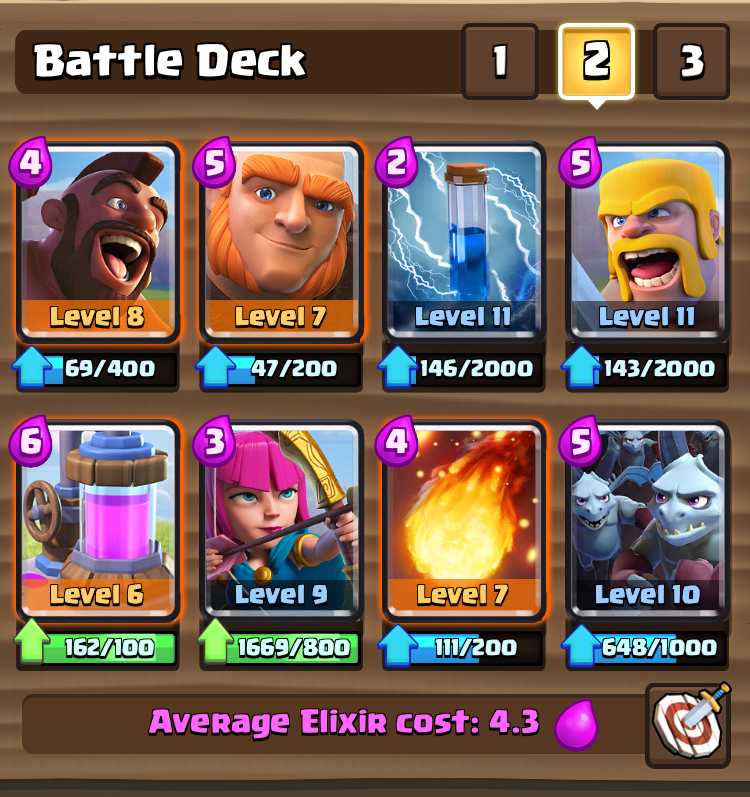 While it is quite difficult making decks with only the cards first available in Clash Royale, you just have to think about the old metas and what was popular at the time. If you guys have been playing Clash Royale for over a year, you will know that 3 decks really shone at the beginning: hog freeze, “Jason” deck, and giant witch! Hog freeze was DOMINANT at the beginning of this game. Playing a fast cycle deck can really give you an advantage over your opponent since you have a cheap deck meant to catch your opponent off guard and land quick pushes. The winner of the first Clash Royale tournament, Jason, played this deck and had amazing success with it. Since it was early in the game, you guys should find just as much success with it during the Retro Royale event! Lastly we have the giant witch Retro Royale deck, which was super popular because of the almost certain counters of barbarians and minion horde. Big pushes are this deck’s specialty! So that is going to be all for our Retro Royale strategies and decks! I hope that you guys learned a lot from this article and are ready to succeed in this special event challenge. Thanks for reading and comment down below what you think of this new challenge! Pingback: Decks and Strategies to Win Retro Royale Challenge | Clash of Clans Guide, Strategies, Tricks and More! 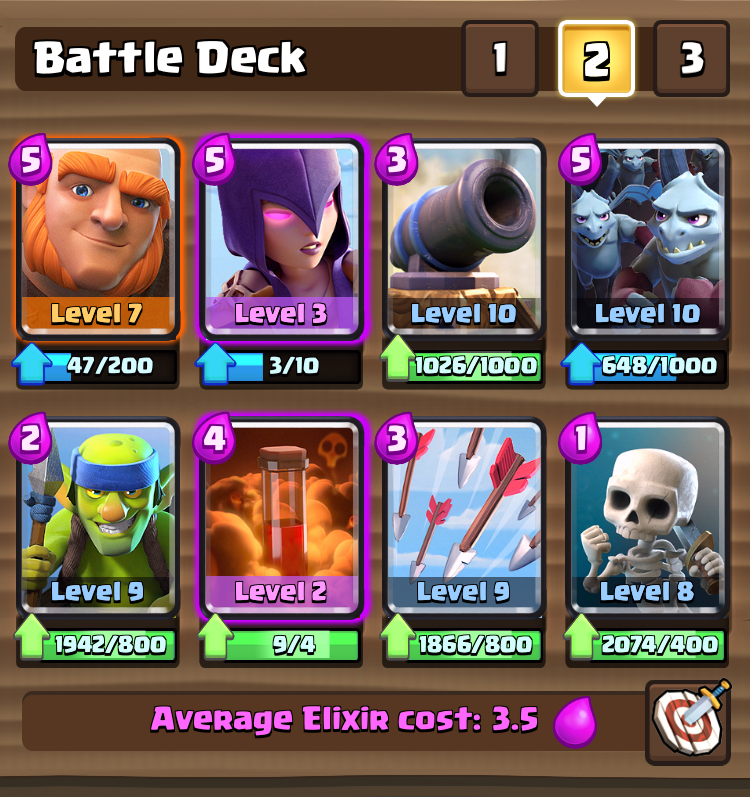 Yo, I got 6-1 with this deck: Golem, witch, zap, minions, skarmy, bomber, archers, fire spirits. Works great, golem doesn’t need to be hidden until the end, your deck is about 3.5, all other cards are pretty cheap,so you don’t really worry about a hog rider – skarmy. Then just bomber and zap the skarmy. If possible, just put witch, and then the spamming strategy even works. 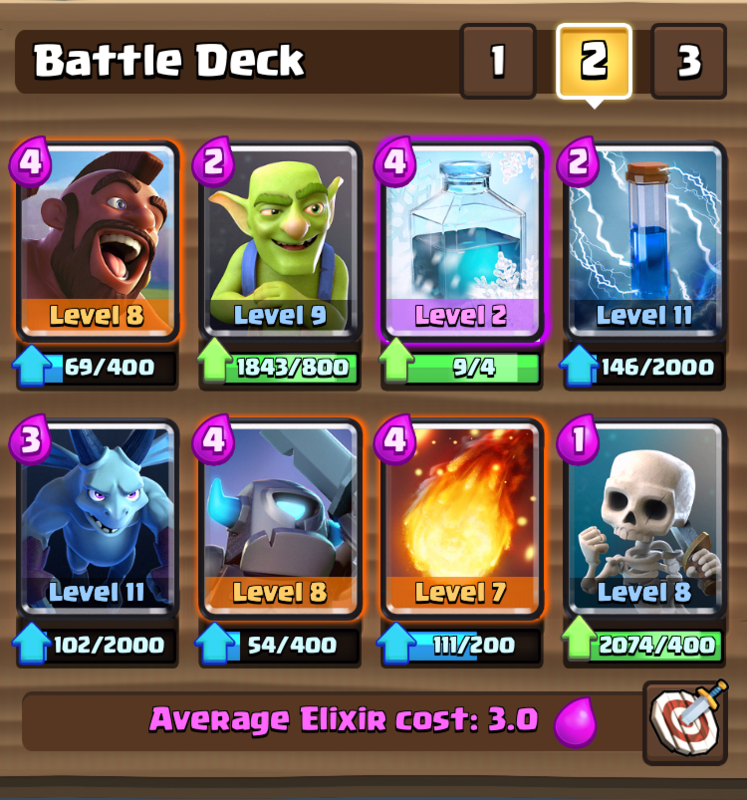 I’d planned to use hog freeze and giant witch prince at the same time, along with zap skeleton army and fireball, is that a great idea?